A story from the online and free game EVONY. Long time ago, when women were women, men were men and the riffle only was used to hunt the babarian outlaws out of their former land. Here the story of Lord Zollner begins. Lord Zollner began to build his empire deep in the land of Evony. He build a Townhall where he could rule his future army from. After a while he grew lonely. He began to build Cottages and a few days later farmers and workers began to inhabit his cottages. He needed more. He build a farm for the farmers so there’d be food on everyones table. He build a Sawmill to farm wood to the buildings and his future army. He began to make a Quarry to get stone to his townhall and the walls surrounding his little village. An Ironmine to harvest the finest Iron seen in the great country of Evony. As poeple got to know him, the began to inhabit his little village. He was a fair man and didn’t have that high taxes as the barbarian outlaws had in their cities around the land. His cottages became too small for those who moved into his village so he had to upgrade the cottages so more folks could come in and work for him. Traps were set around the vicinity of the village to catch the enemies infantry and spyes. The townhall began to feel small in his newly build village. He upgraded the townhall and the cottages along the way. More farms, Sawmills, Quarries and Ironmines were needed. He build a Rallyspot for his future army, so they could come and go from the still little village. The he build some Barracks to train his armies. At first Warriors come to his aid to hold the defense surrounding the area with the Traps from his Walls. A Forge was build to upgrade the armor his Warriors were wearing. Then a Stable for his horsemen. A Reliefstation was also nessesary as it was hard times in the county of Evony. Lord Zollner’s kingdom grew larger and more powerful. He needed to build a Warehouse or two to hide the food, lumber, stone and iron from the barbarian hords. An Inn and a Feastinghall was build to recuit new Heroes that could lead his armies out in the land of Evony to meet his enemies and get rid of the Barbarian hords that grew stronger around the land. A Marketplace was build to buy and sell the goods of other Lords in the country. A Beacon Tower was build to warn against his enemies incomming hords. 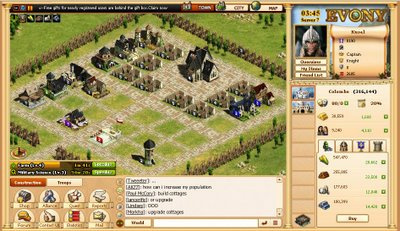 A picture from a city in the game of Evony, here u can see the farms, quarry's, sawmills and Ironmines. The adventure of Evony continues. An Academy and a Workshop was build to research how to make more crops with the new Agriculture and how to make more out of the woods with Lumbering. More Cottages was build. Lord Zollner’s Townhall and the Cottages was upgraded. His walls first made of Wood, would now be rebuild in stone from the many Quarries he had outside his now big village. The Barracks with held his Warriors grew larger. Scouts were recuited to scout his enemies, Pikemen to fight off the Cavalry from Lords that was envying his progress. Swordsmen with large shields to fend off Archers from other parts of the land and to farm the nearby Woods, Hills and Swamps from the Barbarian Hords. The Academy began to research in Masonry and Mining so Lord Zollner could harvest more stone and Iron. They researched in Metal Casting to further upgrade the production speed of Mechanics. Informatics was researched by the scouts to get more detailed information from the enemies they were scouting in the area. The village grew into a small Town. The Townhall, Cottages and Walls were upgraded further as was the Barracks and Academy. Archers was recuited to hunt down the infantry of his enemies and to avoid the enemies traps. The light Cavalry was also requited for their speed and they were good for plundering his enemies resources. In the Academy they began to research in Military Science for more fast recuiting of the Infantry troops and Military Tradition for stronger weapon than those of the enemy. Iron Working was researched to build better armor and Logistics was researched to get bigger and better backpacks for Lord Zollner’s troops when they were out plundering his enemies. More people came to the little town as it was fast growing into a small city. Lord Zollner hunted Medals and grew slowly but steady into a General, a Baronette and a Marquis. When his Heroes had been out hunting he would reward them with medals as they were his generals in this often hostile environment. He began to requit Cataphracts, horsemen with heavy armor and larger and bigger weapons to fight his enemies that also grew larger. Their cities was not far from his own. He began to exspand his kingdom and began to build a new town not far from his own. In the Academy they researched Compass for better cloth for his infantry troops, so they could move faster and lighter in the Hills and Valleys when out training or plundering in the country of Evony that grew Larger day by day, as more people came and settled down in this hostile environment. The traps around the city was no longer enough. He began to build Abatis, wooden barricades to stop forthcomming horsemen. Archer Tower’s was build on the walls to shoot his enemies would they come too close to his cities. Rollinglogs were set up outside on the walls to crush his enemies as they tryed to plunder from him and Defensive Trebuchet’s was build to crush his enemies siege weapons when they attacked him. What's inside the walls of a city? Horseback Riding was researched at the Academy to get the horses and mechanics to go faster on the roads that would be build in the country. Archery to upgrade the archers bow’s and make finer arrows that could pierce the enemies metallic armors and Stockpile to find better ways to hide the stock in the Warehouses. More Cottages, Farms, Sawmills, Quarry’s and Ironmines were needed and was fastly build. The Ballista and Battering Rams was build in the aid of his now large army, that grew larger every day. Battles in the country of Evony was now a reallity. Lord Zollner needed to build an Embassy so he could join an alliance with other players in this great country. He began to build Catapults to smash his enemies to pieces. The Academy researched in Medicine to give his armies more life, and when wounded in battle they would go to the Medic Camp in the Rally Spot, where fine doctors healed them of their wounds. 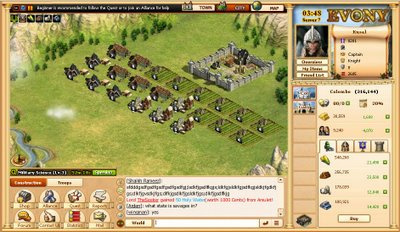 Construction was researched to find faster and better ways to upgrade his buildings and Engineering was researched to enhance the life of his walls and fortified units in Lord Zollner’s now great army. But he needed more. New towns and cities was build in his name and food, lumber, stone and iron was beeing transported between his ally’s and his own cities. His small city was now grown into a great one. The heroes he’s hired had begun to get better in Warfare and the Mayor in his cities was getting better in Politics when they discussed the future of the cities around the country of Evony. Machinery was researched at the Academy to fine faster and better ways to repair the fortified units and finaly when the town had grown as big as it could they researched Privateering to find ways to plunder his eneimes warehouses as well. The game of Evony could begin. This is Lord Zollner of Server 40, sighning off for today. The story will continue in this FREE game. The land in wich many a player live his life in the FREE 4-ever game of EVONY.